Apparently as the universe’s idea of a joke, I’ve been sick more or less nonstop since my return from the Caribbean nearly two weeks ago. ENOUGH ALREADY, UNIVERSE. I GET IT. Anyway, the subtler nuances of food and wine have pretty much been lost on me. The only thing I want to eat is hot soup. Preferably spicy. Now, it should not come as a surprise to anyone who has read my blog that I am (perhaps inordinately) fond of chilis. So of course I love Korean food. 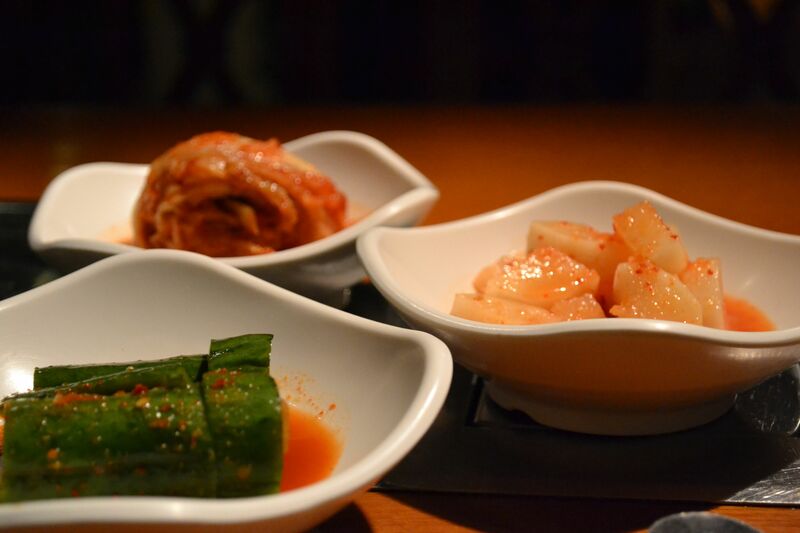 There is some fantastic Korean food in Seattle, but in London there’s a lot of not-great Korean food, and even more not-great quite-pricy Korean food. For this reason I keep coming back to Asadal. I really like this restaurant, actually, even though it’s not the very best Korean food I’ve had, and it is a little spendy. But it’s consistently good, and just weird enough to make me want to return. Located at the of bottom steep stairs directly beside the Holborn tube station, Asadal is utterly devoid of natural light. The dropped ceilings, blocky design, and dark wood accents make it feel like a business class lounge at an airport circa 1981. And the service is just this side of too solicitous. Everything is mixed, tossed, grilled, and plated for you; one gets the sense that the servers are barely restraining themselves from hand-feeding you. I’ve been to Asadal probably three or four times, always with friend R, who works round the corner. 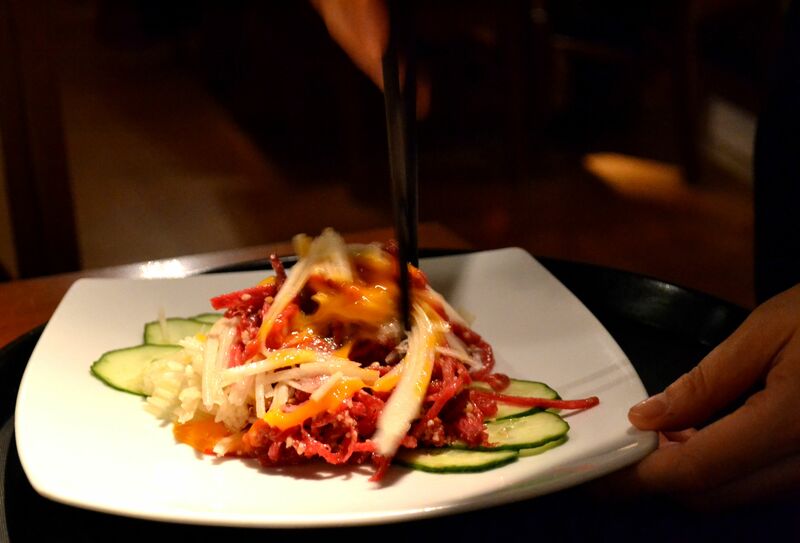 R always orders the same thing: Yuk Hwae (£9.90): raw beef sliced into tidy slender oblongs, served with a raw egg yolk, sesame oil, and lightly sugared shredded pear. The beef is a little fatty and icy cold, and melts against the slight crunch of the sugar crystals on the pear. I like this dish, but my palate’s accustomed to western and Japanese tartares and carpaccios, so I find it a little too sweet and lacking in acid. 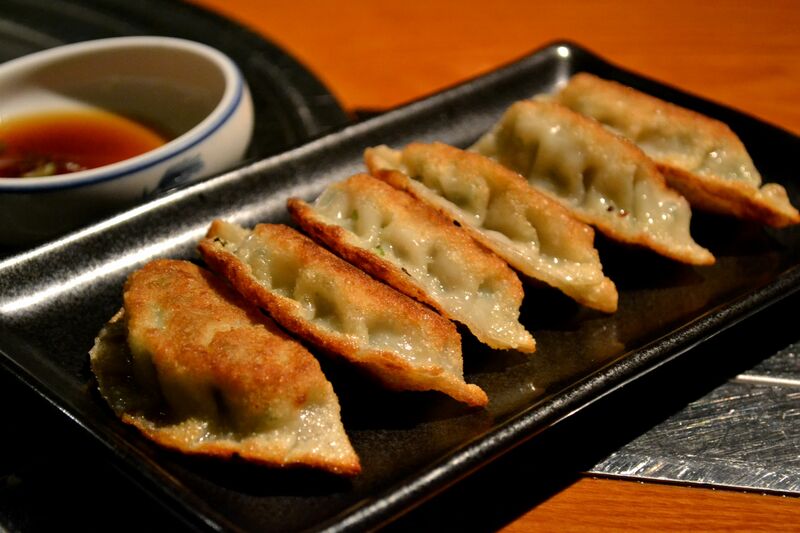 Kun Man Du (£7.50, pork and chive dumplings), however, are satisfyingly hot, crispy, and flavourful, and well-complemented by a slightly astringent soy dipping sauce. I’m offended that kimchees are not free, as they are in Korean restaurants in the United States. Although Asadal’s radish and kimchee salad is tasty, and the pickled cucumber nicely crunchy, tart, and spicy, £6 for three tiny bowls of kimchee is bloody steep. 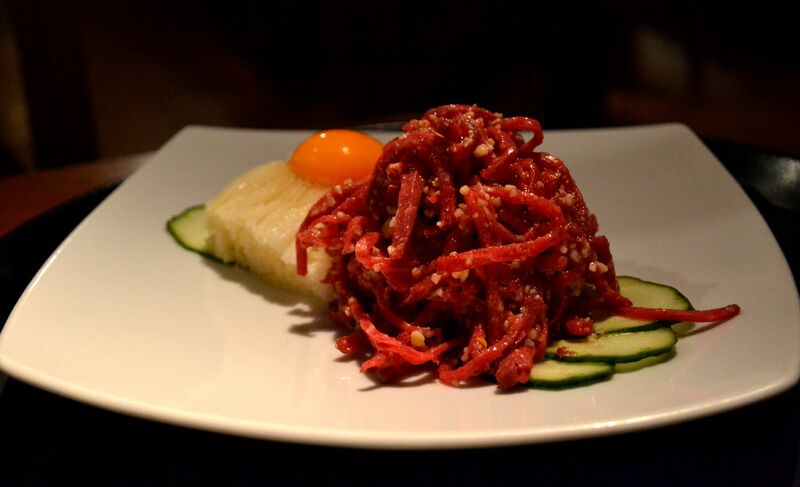 And while we’re on the subject of high prices, friend R’s vegetarian bibimbab was £12.50. But back to my lurgy. 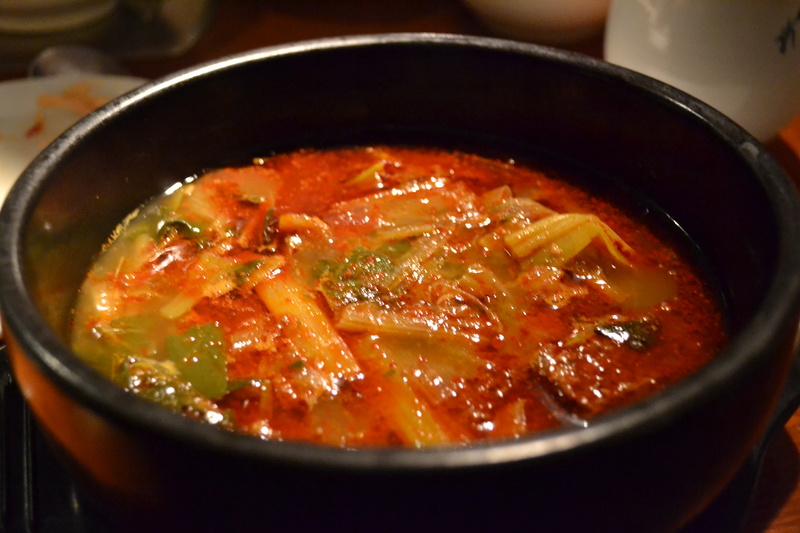 For lunch this time I had the Woo Guh Ji Galbi Tang (beef short rib and vegetable soup, £9.50). Served bubbling hot, a generous layer of head-clearing chili and oil lies atop a clear beefy broth rich with chunks of toothsome, tender short rib and plenty of kimchee. By the end of it I was high on chilis and my nose, for the first time that day, was blessedly clear. Asadal is not what I’d call “budget dining.” I always spend more there than I intended or anticipated – e.g., on this occasion, our bill was £47.40 not including service – and at nighttime, if you use the grill, you can rack up quite a bill very quickly. But in all its charming, awkward weirdness, Asadal’s a safe bet. And some times, that’s exactly what you want. 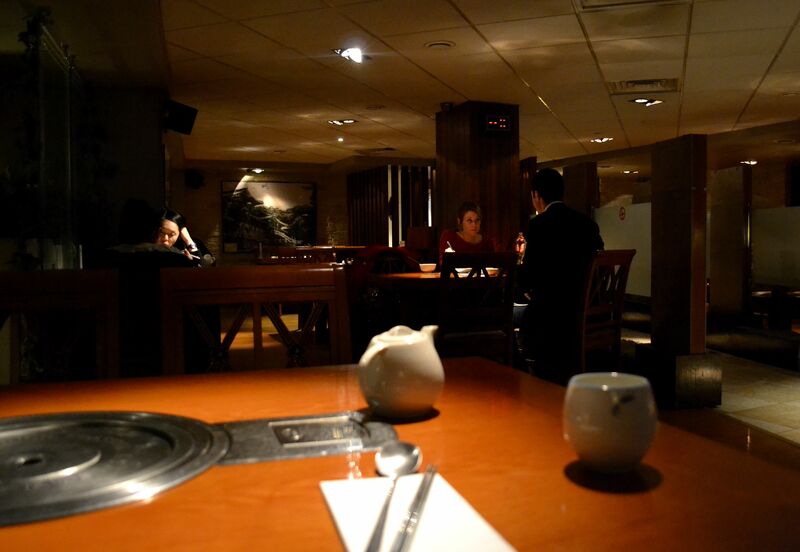 This entry was posted in Holborn, I'd eat here again, Kinda Splurgy, Korean, London Restaurants by Cuisine by Susan. Bookmark the permalink. Not amazingly cheap, but not expensive. The food is freaking triple-A! I haven’t. I’m not often in SE16 (and correct me if I’m wrong, but this doesn’t sound like it’s worth a special trip…?) but I will make a Mental Note. When I lived in SE18 (yuk!) I used to go there all the time and loved it. It’s a short bus-ride from North Greenwich so not so difficult to get to. Worth visiting! oooh nothing like spicy food to beat the flu! oh btw kimchi is supposed to be really healthy and good for the immune system. Now that you say that, I think I knew that. Apropos of nothing (or rather, apropos of Korean food) have you seen the Momofuku cookbook? A friend cooked from it for NYE and now I COVET it. You’d love it, I think. Thanks very much Jennifer! And thanks, as always, for stopping by.